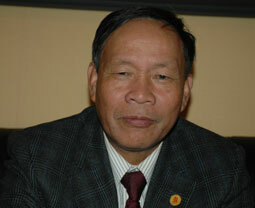 Right after arriving in Paris to take part in the International People’s Tribunal of Conscience’s trial, Senior Lieutenant General Nguyen Van Rinh, President of the Vietnam Association of Victims of Agent Orange (AO)/dioxin (VAVA) gave Paris-based from Nhan Dan (People) Newspaper correspondents an interview. A: At the invitation of the IADL, a delegation from the VAVA will attend the trial as witnesses and victims. In our opinion, this is an extremely important initiative given by the IADL to open the trial against the <?xml:namespace prefix = st1 ns = "urn:schemas-microsoft-com:office:smarttags" />US manufacturers of Agent Orange/dioxin chemical which was sprayed by US troops during the Vietnam War. We will provide the tribunal with all witnesses and material evidences on the consequences of the toxic chemical used by US troops during the war. Especially, the Vietnamese scientists and victims will give their speeches on terrible effects of the AO/dioxin sprayed by US troops in Vietnam. It is hoped that the trial will help people worldwide to clearly understand the barbarity of the war caused by the US troops in Vietnam. Vietnam has so far suffered the long-term consequences of the AO/dioxin, caused by US troops’s detestable crime. The effects of the toxic AO/dioxin on human beings and ecological environment are extremely serious. The most severe legacy is that more than 3 million Vietnamese people are now AO/dioxin victims. Many people of them are now facing death day in and day out. Q: As a person who went through the anti-US war of resistance for the national salvation and as a direct witness, what is your judgment about consequences of the toxic AO/dioxin? A: Being people who directly joined the anti-US war of resistance, we used to live in toxic environment caused by the US. Currently, most of the Vietnamese war veterans who fought on the battlefields in the South of Vietnam are exposed to the deadly toxic AO/dioxin. Their health has severely worsened and most recently they have suffered from cancer, diabetes and other diseases. Some of these war veterans bear their children with disability or inability to look after themselves. Q: As a president of the VAVA, what is your aspiration regarding the trial? A: I wish that this trial will clarify legal issues for the US administration which directed the war in Vietnam, as well as legal responsibility born by the US manufactures of this AO/dioxin which has caused such deadly consequences. Q: The US Supreme Court has refused to review the petition to reinstate the lawsuit lodged by the victims of AO/dioxin (VAVA) against US chemical companies. What is your assessment of this decision? A: The Vietnam War was over 30 years ago. Other consequences of this war have been overcome by the Vietnamese Government and people. Currently, our country is developing yet the US government has taken no interest and settling the consequences of the AO/dioxin in Vietnam despite a lot of condemnations by public opinion worldwide as well as in Vietnam and right in the US. Nowadays, US Government has had to spend billions of US dollars supporting US servicemen and women who joined the Vietnam War. The US chemical companies have had to compensate the American war veterans hundreds of millions of US dollars. But, the US Government and companies which supplied AO to US troops during the Vietnam war are yet to take any responsibility for the Vietnamese people, especially Vietnamese AO victims. In my opinion, the verdicts given so far by the US courts in the lawsuit lodged by the Vietnamese AO/dioxin victims against the above-said US manufacturers of Agent Orange/dioxin are unreasonable and inhuman. I hope that the US Government and chemical companies will wake them up regarding this problem. They must bear responsibility for Vietnam’s ecological environment and human beings being contaminated by this toxic chemical.